Even after America won her independence from Great Britain, European countries continued to threaten the United States. Because of this, many U.S. leaders were cautious of European political associations. Both President George Washington, in his “Farewell Address” (see Washington’s Liberating Letter), and President Thomas Jefferson, in his first inaugural address, warned against forming close political alliances with European countries. In his annual message to Congress on December 2, 1823, President James Monroe reiterated this unwritten policy. Monroe’s predecessor, President James Madison, found the United States once again at war with the Red Coats in the War of 1812 (see Hold The Fort). During Monroe’s presidency, Russia began making claims on the northwestern portion of the western hemisphere while Spain and France threatened Central and Southern America. Latin America had already fought their own revolution, winning independence from Spain. However, new possible agreements between Spain and France raised the potential of revived European intrusion in the area. Britain’s foreign secretary George Canning, also wanting to prevent further Spanish colonialism in the New World for trade purposes, suggested a joint warning against European countries interfering in Latin American affairs. Monroe’s cabinet weighed the proposal, while Monroe sought the advice of former Presidents Jefferson and Madison. Monroe’s predecessors, and much of Monroe’s cabinet, agreed with the joint warning. Secretary of State John Quincy Adams, on the other hand, vehemently opposed such a shared announcement. He argued it would diminish America’s standing in the eyes of the world, once again putting Britain in political power over them. After much debate, not only did Adams’ argument win out, he ended up drafting much of Monroe’s December message. As Adams took office a year later (see History Rhymes Again), this policy, eventually named the “Monroe Doctrine,” became the unofficial foreign policy for America. Unfortunately, several presidents have stretched and twisted Monroe’s and Adams’ original intent to justify their desires, making the policy virtually unrecognizable anymore, starting with Adams’ successor and “Father of the Democrat Party,” President Andrew Jackson. Jackson governed under his own philosophy, which converted the American ideology up until that point of Divine Providence (see God’s Divine Providence) to manifest destiny (see Satan’s Manifest Destiny). Both concepts see America as a “shining city on a hill,” however the avenue to which to share God’s grace is quite different. Divine Providence aims to do God’s will, shaping society through example. By leading Christian lives, non-believers will not only benefit from that morality, God willing they will desire it for themselves as well. On the other hand, manifest destiny pursues societal transformation through conquest and force. In other words, Washington, Jefferson, John Adams and Benjamin Franklin all commented that a free society can only exist if the people are moral and just. Therefore, a religiously based population is necessary for liberty. Manifest destiny strives to accomplish its goals through force and legislation. People stopped allowing God to work through His people and started instituting their own policies in God’s name, and in some cases, eventually removing God all together. How interesting it is that the same people who accuse America of forcing their values and principles on others actually support and use the very same ideology to further their own agenda. At the same time, they ridicule and belittle conservatives who only want to return to the Monroe Doctrine and Divine Providence, which promotes societal change through example and not force. Jackson used manifest destiny to become a very wealthy man. He entered the White House a poor man but he left a millionaire. During his presidency, he unconstitutionally used his position to obtain Native American lands. Under the guise of manifest destiny, he worked with his government friends to grab and cheaply buy native territories, and then sell them off to settlers at enormously inflated prices. Jackson’s vice-president and presidential predecessor, Martin Van Buren, continued Jackson's policies, resulting in the forceful removal of Native Americans westward on the Trail of Tears. As with the Monroe Doctrine, manifest destiny was not officially named until years later. Due to British and French efforts to become involved in annexing Texas, as well as California and Oregon, Democrat President James K. Polk promoted manifest destiny in his December 2, 1845, speech while Whigs, and then Republicans, continued to reject such ideology. He cited the Monroe Doctrine as justification for America moving into other western hemisphere affairs, even using offensive, as opposed to defensive, actions to accomplish their goals. Republican presidents such as Abraham Lincoln and Ulysses S. Grant outright objected these concepts. 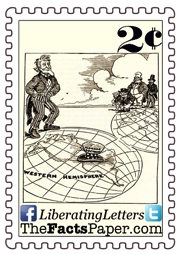 In Republican President Theodore Roosevelt’s December 6, 1904, address, he added what is considered an amendment to the Monroe Doctrine, giving America the right to intervene into western hemisphere affairs regarding economic concerns. Referred to as the Roosevelt Corollary, his initial goal was to prevent European countries from financially intervening with Caribbean and Central American nations unable to repay their international debts. Citing the Monroe Doctrine, he connected it to his own “Speak Softly and Carry A Big Stick” foreign policy, claiming America had a right in all western hemisphere affairs. The amendment quickly replaced the Monroe Doctrine’s prevention of European involvement with an American policing responsibility. While this new policy contradicted Roosevelt’s fellow Republican opposition to forced American interference, his progressive comrades fully embraced it. Early 20th century presidents used the Roosevelt Corollary to impose in several Latin American and Caribbean national issues. However, the Clark Memorandum under Republican President Calvin Coolidge reestablished the original intent of the Monroe Doctrine, separating it from the Roosevelt Corollary. The memo reiterated the Monroe Doctrine did not give America policing rights to indiscriminately meddle in Latin America. There must be a threat by European powers first. Democrat President Franklin D. Roosevelt, Theodore’s cousin, not only rejected the Roosevelt Corollary, he took an even more hands off approach with his “Good Neighbor” policy. While he desired to strengthen trade relations with Latin America by backing off from their affairs, he also allowed dictators to conquer the free and independent nations as long as they were not from the European Powers. Conversely, as communism invaded Cuba in the 1960’s, Democrat President John F. Kennedy invoked the Monroe Doctrine in efforts to stop the dangerous political and social ideology that was already responsible for millions of deaths. Though many presidents have honestly applied the Monroe Doctrine, others have deceitfully used it to push other agendas. Progressives in both parties have pushed FDR’s Good Neighbor policy so far that they have completely reversed the Monroe Doctrine. Instead of rightfully rejecting interference from outside countries in our affairs, they now welcome, call for, and embrace that interference. Progressives argue America should actually be modeling European countries as America has been horrible from her beginning. The mind-boggling fact about this viewpoint is America was founded and settled by Europeans. If America was, in fact, started illegitimately and on a horrible foundation, then logically that all falls back on Europe. They are exactly who we should be distancing ourselves from, which is exactly what the founders and patriots did. Yet somehow progressives believe that Europeans the saviors of the appalling nation they started. As progressives proclaim to denounce the intervening actions of our nation, they continually fail to recognize those very actions are quite often performed by their own political heroes. Once again, Liberty, the adage that “those who fail to learn history are doomed to repeat it,” rings true. Furthermore, as cries for America to adopt European policies continue, Solomon’s proverb, “As a dog returns to its vomit, so fools repeat their folly,” also proves accurate. During the Obama Administration, officials agreed the United States would comply with immigration policies designed by the United Nations. Fortunately, in a recent statement, current U.S. Secretary of State Nikki Haley announced America would no longer adhere to the Global Pact on Migration, guidelines set by Old World powers. She explained, “Our decisions on immigration policies must always be made by Americans and Americans alone. We will decide how best to control our borders and who will be allowed to enter our country.” Stating security reasons, Haley once again returned America to Monroe Doctrine policies of “we’ll take care of us, you take care of you.” That doctrine outlines that there needs to be a balance that not only will we stay out of your affairs, but you also need to stay out of ours. A shift either way leads down a path of being a conqueror or being conquered. Liberty, once again our founders were very astute men who understood the workings of governments all too well. The Monroe Doctrine is an excellent policy for all nations to follow. But as history shows, even the best principles are diminished or destroyed as people twist and turn them to fit their own political ideology. Man repeatedly takes the power out of God’s hands, Divine Providence, and puts it in their own, manifest destiny, expecting amazing results. However, we must always pray people see their error and return to the only solution - faith and trust in our Lord and Savior, Jesus Christ. Regardless, never forget Christ has already established Utopia and will soon come to take us there.